Obituary – Loeffelholz, John Reginald « Perry High School Alumni Association, Inc. Band ’44-’47; Band President ’46-’47; Student Council ’44-’46; Wrestling ’44-’45; Annual Staff ’45-’47; Annual Follies ’45-’46; Perryscope Staff ’46-’47. “Reg” Loeffelholz passed away on April 24, 2015. He was born in Norman, Oklahoma, on May 28, 1929, to Mr. and Mrs. Henry Loeffelholz. He moved to Perry, Oklahoma when he was six weeks of age. He grew up there, and graduated from Perry High School in 1947. 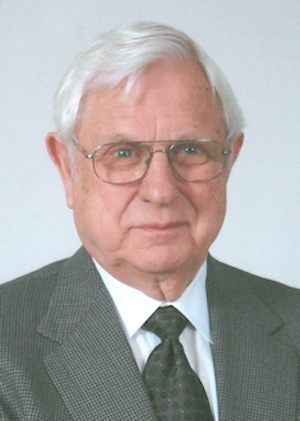 Reg earned a degree in Agricultural Economics from Oklahoma A&M (OSU) in 1951. He was a member of the Sigma Phi Epsilon Fraternity and on the Dean’s Honor Roll. In 1952, he married Jerry Sue Story, a fellow student at A&M. He soon went to work for the Oklahoma Farm Bureau Insurance Company. During his career he rose through various positions of Executive Vice President and General Manager. Reg and his wife Jerry raised four children of their own and helped raise two nieces and a nephew. Jerry died of cancer in 1994. He married Patricia Fletcher Myers of Macon, Georgia, in 1996, and lived in Oklahoma City. They enjoyed traveling to visit children and grandchildren, and following the OSU Cowboys. Reg served as a docent at the National Cowboy and Western Heritage Museum in Oklahoma City. He and Pat are members of the Greens Country Club and Christ the King Catholic Church. 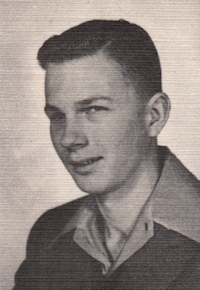 Reg was preceded in death by his parents, Henry and Regina Loeffelholz, his sister, Josephine McMorris, his wife, Jerry Sue Loeffelholz, and his grandson, Hank Sasser. He is survived by his wife, Patricia Loeffelholz, his children, Kathy Jones of Houston, Texas, Brad Loeffelholz of Ft. Worth, Texas, Kurt Loeffelholz of Oklahoma City, and Linda Sasser of Suwanee, Georgia; also, step-children, Betsy Lord of Cleveland, Georgia, and Jamie Williams of Marietta, Georgia, and four nieces and one nephew; his pride and joy were his twelve grandchildren. Donations may be made to the Wounded Warrior Project. A Mass of Christian Burial will be celebrated at Christ the King Catholic Church, Friday, May 1, at 12:00 noon. Visitation will be at Smith-Kernke Funeral Home on N. May Ave. on Thursday, April 30, from 6:00 to 8:00 p.m. Interment will follow at Chapel Hill Memorial Gardens.